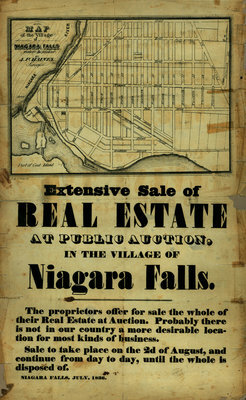 A broadside advertising an 'Extensive sale of Real Estate at Public Auction, in the Village of Niagara Falls', [New York]. It is dated at Niagara Falls, July, 1836. The text reads 'The proprietors offer for sale the whole of their Real Estate at Auction. Probably there is not in our country a more desirable location for most kinds of business. Sale to take place on the 2d of August, and continue from day to day, until the whole is disposed of'. A map of the property involved is also included, 'made for the proprietor by J.P. Haines, Surveyor'. The proprietor is likely Benjamin Rathburn, a builder, banker and businessman who speculated in land in the Village of Niagara Falls in 1836.